Better roll-off performance and greater camera sensitivity enables visualization of deep vasculature in the dermis. 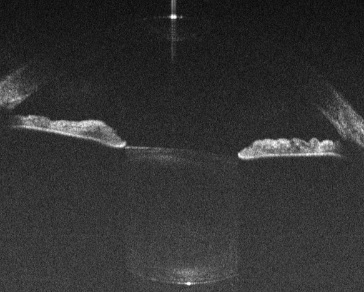 Imaging of the full anterior chamber is possible with the 12 mm imaging depth of our newest Cobra-S model. OCT angiography scans captured with the Cobra-S 800 exhibit reduced motion artifacts due to the high speed of imaging, in addition to high resolution. The Cobra-S 800 ultra high speed spectrometer heralds a new era in spectral domain OCT. We’ve paired our industry-proven high throughput spectrometer design with athermal optomechanics and the fastest camera on the market for extremely high resolution imaging at more than 2-3x the speed of conventional OCT spectrometers. This compact, robust Cobra spectrometer employs a revolutionary new design and camera to achieve line rates approaching SS-OCT for significantly higher speed and better roll-off than any other SD-OCT spectrometer on the market. From bloodflow dynamics and vibrometry to imaging of dermal vasculature and choroidal structures, the Cobra-S 800 delivers the speed, clarity, and depth you need. 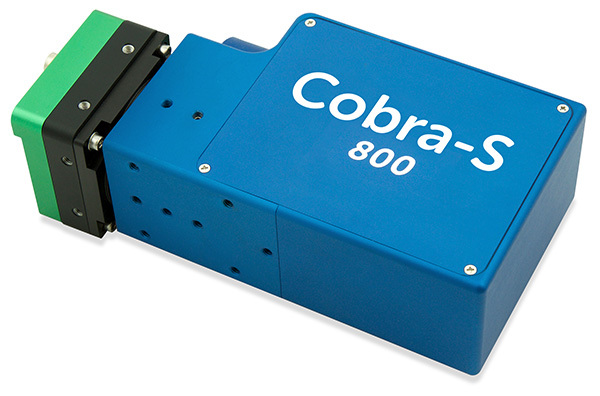 Cobra-S near infrared spectrometers can be used for ultra high speed OCT imaging in the 650-950 nm range in research, industrial and OEM solutions. Let our expert team put together a configuration that is right for your application – contact us at info@wasatchphotonics.com. Our newest Cobra-S model uses a patent-pending optical design to provide up to 12 mm imaging range at 800 nm. 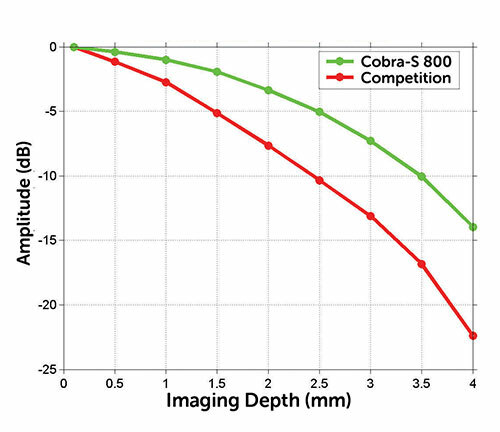 This allows long-range imaging of the full anterior chamber and other curved surfaces to be accomplished in a single shot using 800 nm OCT. Once accessible only via 1300 nm OCT imaging, this unique Cobra-S model extends the reach of 800 nm OCT to depths of >10 cm at half the cost, with no loss in image resolution. To learn more about the benefits of long-range 800 nm imaging, sign up for our newsletters to read our upcoming tech note. Reap the benefits of speed and flexibility at reduced cost with the addition of our USB 3.0 interface option for the Cobra-S. USB 3.0 eliminates the need for an expensive camera link card and allows compact computers like personal laptops to be used for OCT imaging. The power of USB 3.0 combined with our dedicated software libraries facilitates easy integration of high-speed OCT into your imaging platform. 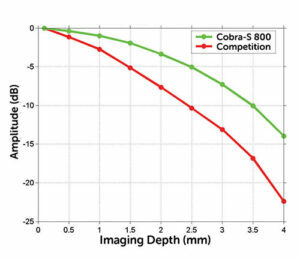 The Cobra-S 800 offers superior roll-off performance as compared to traditional OCT spectrometers, as can be seen in this comparison of signal with imaging depth. With less roll-off, much deeper structures can be imaged clearly than is expected of typical 800 nm imaging. Cobra-S 800 part numbers are of the format CS800-[CWL]/[BW]-[kHz]-[camera][pixels]-[interface], where the e2v OctoPlus camera is represented by “OC”, 2K denotes 2048 pixels, and the interface is either camera link (up to 250 kHz, denoted by “-CL”) or USB 3.0 (up to 130 kHz, , denoted by “-U3”).